3 Curious Monkeys : Helping Raise Culturally Curious Kids – Grab a cuppa, tell a story or listen to one. Living Your Dreams – Story #6 It is one thing to dream and feel strongly about a cause /concept, it is another to work towards and be able to build something constructive. Today’s story is about two people who built something they felt for and dreamt of. They continue to do so. A few weeks back, in San Francisco’s very first community Ganpati celebrations, I was drawn towards a booth setup for “3Curious Monkeys”. I skipped everything else but Ganpati and made my way there. Books and authors work as a magnet for me. 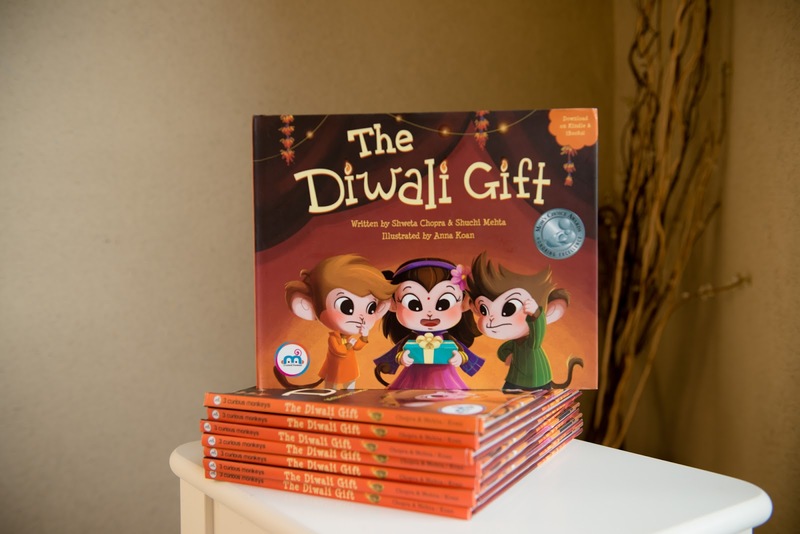 I caught a glimpse of the book “The Diwali Gift” on display – an animated book telling the story of Diwali through the three characters, Suno (Listen), Dekho(See) and Jaano (Learn). The animation on the book was brilliant, the three main characters appeared contemporary and there was no hint of mythology. My daughter, who was accompanying me, kept turning pages and gulped down the book in just a few minutes. A twinkle in her, a sense of curiosity and a desire to read more – it was all present. So while she was reading, I met with the authors, Shweta Chopra and Shuchi Mehta, also present in person at the event. 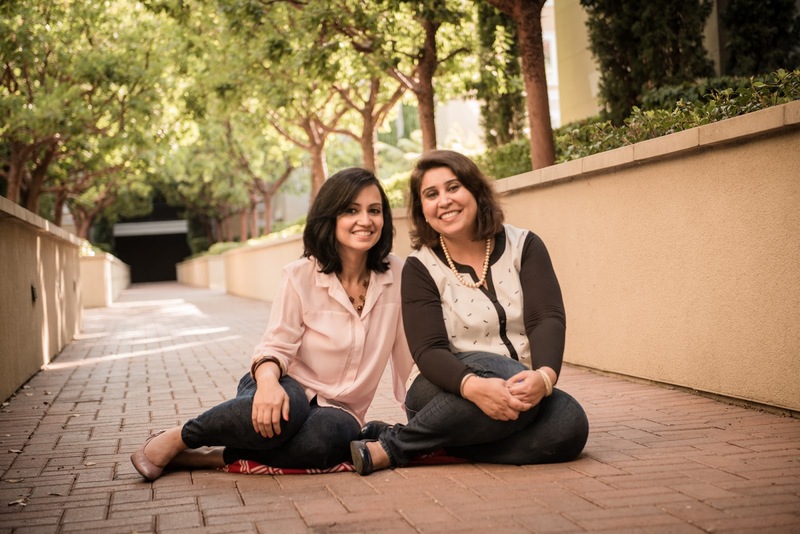 Shweta and Shuchi are two San Francisco Bay Area mothers of Indian origin, who are extremely passionate about keeping kids connected to their roots. In today’s global world, it does not matter where you live on the map, but it is important to be able to comprehend and to stay connected to our roots and the culture thereof. Like many other parents living outside India, these moms too found it difficult to make Indian culture relatable to their children. They researched ample reading materials, educational materials and apps to find representation of India and there was hardly any in the mainstream media. Of what was there, the focus was on mythology and religion and the representation such that was not very relevant or fun for young kids. A Diwali story could be told with the mention of diyas, mithais and firecrackers and sans the compulsory mention of Ram’s homecoming. It could be told in a way that the Rangoli becomes as mainstream as the Christmas tree in the living rooms all across the world. This is where these moms took a giant step. They quit their corporate jobs as experienced marketing professionals and founded 3 Curious Monkeys with the idea of creating apps and books and other materials related to Indian culture. The idea was to create something that was mainstream, global, appealing but also a lot of fun. It was not an easy decision to make and they knew that it was not going to be easy. But it was their determination and a belief in their dreams that paved the way for them. “Suno, Dekho and Jaano are contemporary characters inspired by Mahatma Gandhi’s monkeys but through those characters we also want our kids to learn more, listen more and observe more. All three characters are very contemporary. We want them to be as popular as Dora, “ Shuchi mentions with an infectious excitement in her voice. It took about 8 months of intense research, long hours of writing and editing the book, developing an app for tablets / phones, finding an illustrator, reviewing illustrations – all done by the duo themselves. “TheDiwali Gift”, their first print and ebook, was released in October 2014 on Amazon. They have also launched an app called “Dress Up Party” that engages young children in a “dress-up” activity to show them the diversity and richness of Indian attire. Next stop, these moms are thinking of adding more to the app and newer books about other Indian festive celebrations, rituals and Indian food. They currently do book reading sessions at many children and social events. They are working with bloggers to come and share their stories and opinions on varied related subjects. They are constantly also reaching out to everyone globally to identify areas that should be discussed more in mainstream media. I nod my head in agreement as I listen to Shweta during our conversation. I understand every bit of that sentiment. I have heard these conversations and statements from parents over and over again, after the PTC meetings, in Diwali parties and in our own living room. It is time we did something meaningful and creative to assimilate the culture that we are so proud of into the global culture and rituals. 3 Curious Monkeys is a humble attempt at doing just that. To learn more about 3 Curious Monkeys, follow them on Facebook / Twitter, you could download their app here and here are some fun worksheets / lesson plans too. Grab a cuppa, tell a story or listen to one. Everyone loves stories. Everyone has a story to tell.